The team at Within has developed Autodesk Within Medical, a software solution tuned to the needs of the orthopaedic industry. This software allows implant designers to create porous coatings for their implants to aid osseointegration i.e. the fusion between bone and implant. Porous - to aid osseointegration with various pore size configurations and lattice topologies. Rough - to aid the fixation of the porous implant with the bone using rough lattice surfaces. Secure - output designs are secure and can only be manufactured by specific manufactures. Accurate for Additive Manufacturing - designs are optimised for specific additive manufacturing processes i.e. DMLS and EBM, allowing for an accurate output. The video above demonstrates how Autodesk Within Medical can be used to design porous implants where the porosity can itself be tuned within the software to allow for optimal osseointegration. 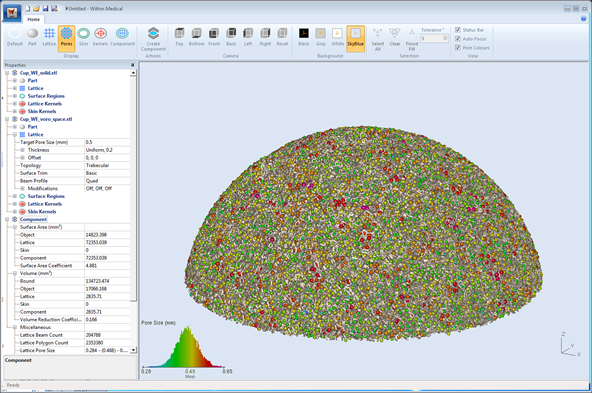 The lattice topologies supplied with this software have been developed with cell growth in mind and are best suited for this function. The output of the Autodesk Within Medical software is also optimised for additive manufacture. Variable Density Lattices - Autodesk Within Medical features Within's kernel technology which can be used to design variable density lattices where the thickness of beams smoothly varies based on a defined thickness range. The variable density can also follow a Linear or Gaussian function which provides users with greater design freedom. Rougher Lattice Surfaces - Lattices designed in Autodesk Within Medical can be made rougher using rough surface regions. This roughness can be tailored to be uniform throughout a surface region or vary in depth. This is very useful when designing an implant to have optimal fixation with the bone. Complete Lattice Beams That Fill A Design Space - Lattices that are trimmed to a design space in Autodesk Within Medical maintain their `completeness' i.e. all lattice beams maintain a cuboid shape after trimming which allows the design to maintain it's porous nature at the surface. Competitive software which booleans a lattice to a design space will usually produce an output which contains sharp sections at the surface and, in some cases, floating segments. These designs may not accurately preserve their porous nature at the surface and can be problematic to manufacture i.e. floating segments can interfere with the rest of the design when manufactured therefore producing inaccurate pores at the surface or wasted sintered powered. Superior Performance When Designing Lattices - Autodesk Within Medical is able to create complex lattice designs that fill a design space in a fraction of the time that it would take in competitive software that booleans lattices to design spaces. These lattices will also be trimmed to the design space and will be displayed as complete surfaces in the software. Users will therefore get an accurate view of what the final design will look like when manufactured. This is not always possible in competitive software. Accurate Design To Manufacture - Autodesk Within Medical has been developed with manufacturing in mind to ensure that the lattices designed and displayed in the software are as accurate as possible when compared to the physical part built using additive manufacturing. Our integration with EOS DMLS and ARCAM EBM therefore allows for accurate manufacturing of Autodesk Within Medical designs. If you are interested in purchasing our software then please contact us for more information at Within Sales.